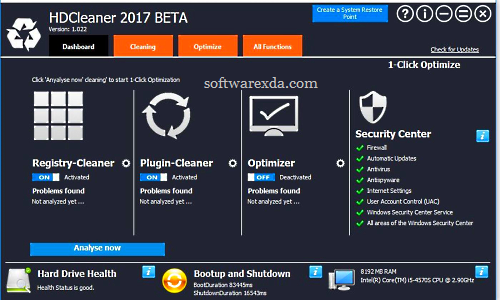 HDCleaner is designed for complete cleaning of your Windows PC including registry and backup, encrypting data, splitting files, removing traces, and more. HDCleaner offers a comprehensive toolkit for system maintenance under Windows. Whether you clean the hard disk or the registry, encrypt data, split files, remove traces of use, backup the registry, defragment or search and replace registry keys, values and data with superfast search algorithm – in the clear Toolbox you will always find the right tool to speed up your PC and optimize.